"You are very good at taking things apart, let's see if you can actually put something back together." 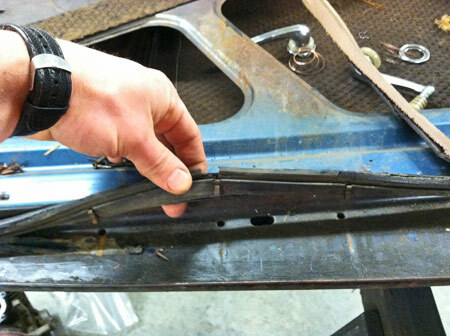 Those were the words from a friend of mine who has been following my 1937 Buick progress for a while. With his words in my head and with much of my engine at the machine shop, cold weather forced me from my unheated garage into my basement where I could work in warmer conditions. My car's starter had been restored just prior to my purchase so I brought my attention to the generator. I am not an electrician but understand the basic operation of a car's generator and have attempted to explain it here. Inside the generator there is a central shaft called an armature. 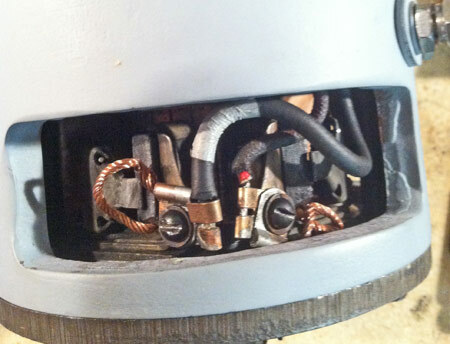 On the inside of the generator's case are magnets wrapped with wire called field coils. 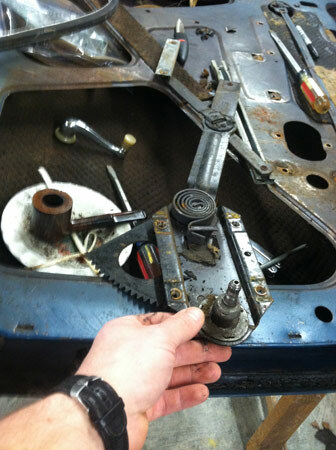 As the armature is rotated by the fan belt it spins by the internal magnets. This generates electricity and that electricity amplified by traveling through the field coils. This is known as electromagnetic induction. The current generated is then passed through metal pucks called brushes that rub the armature and the current passes on to the device demanding electricity (lights, battery, etc.). I assumed that, at the very least, the internal brushes were changed at some point in the car's 77 year/ 57,000 mile history but there was no evidence indicating that any work had taken place in the post-WWII era. Like the rest of my engine compartment and undercarriage, the generator was caked in a generous coating of grease, dirt, undercoating and debris. Starting with a basic wipe-down and scrubbing, I was able to get enough of the crud off the generator to make it easier to handle. After the case was relatively clean I removed the pulley and cooling fan. 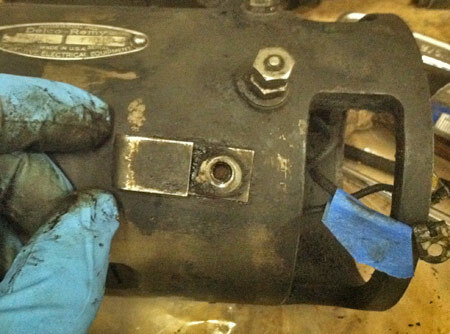 With those pieces off of the unit I simply removed the case bolts and slid the armature out. 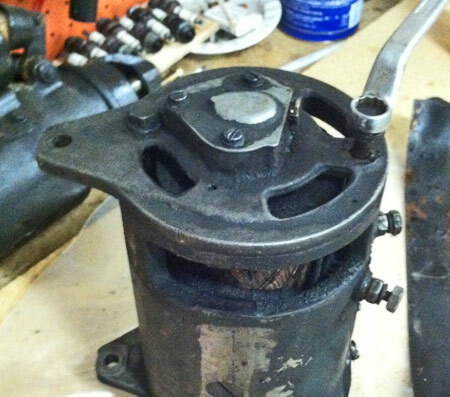 Just like the outside of the generator, the inside was caked in 77 years of dirt and oil. It is really amazing this thing never shorted out. Generator after initial wipe down. Exposing the brushes — what a mess! Remember that this wire harness clip goes on this direction. These worn brushes were easily removed from the generator. 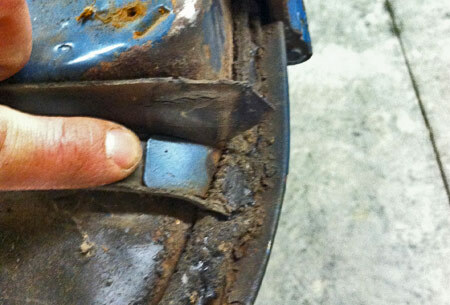 The brushes were greatly worn but they were removed very easily. 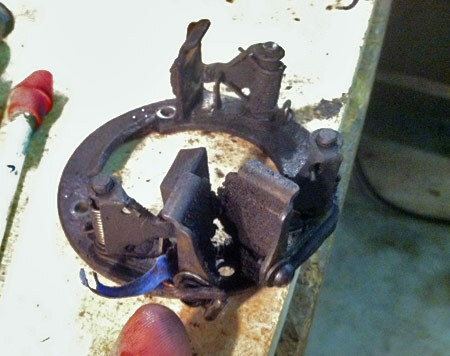 My attention then turned to the removal of the field coils. These coils are each held on by one screw but gorillas must have originally installed mine because I couldn't remove them with a simple screwdriver. I didn't want to use an impact driver or heat because I was concerned I would ruin the wires on the inside. 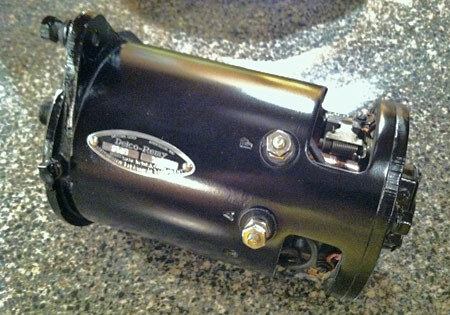 Realizing I could only damage my generator I contacted Jason Smith at Advanced Electrical Rebuilders in Michigan. They performed some work on the AACA Library Bookmobile so I knew they were a reliable vendor. Jason told me to send the case to him and he could take care of those nasty screws and the field coils. Within a week Jason contacted me to tell me some great news — he degreased the case, unwrapped, cleaned and inspected the coils and determined that my original field coils could be reused! After conferring with me about my options, Jason then re-wrapped the coils and provided new leads, primed the case, reinstalled everything and shipped it back to me in Pennsylvania. He also made me a new Delco case tag with stampings. 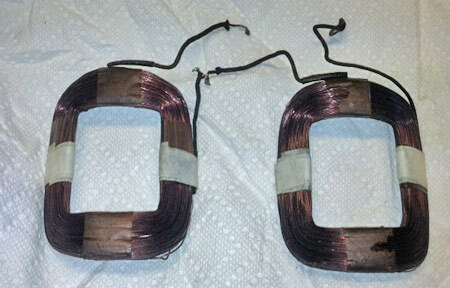 Picture sent from AER after original field coils were unwrapped and cleaned. These units would get rewrapped and new leads. Meanwhile, back in Pennsylvania I was busy with the generator's end caps. 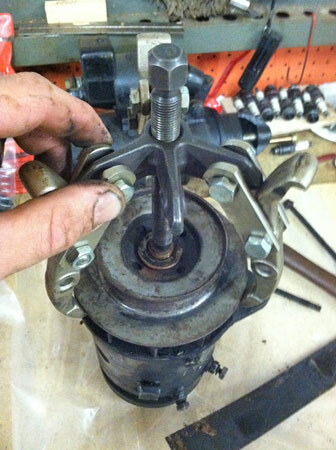 One end cap (non-pulley end) contains a bushing while the pulley end cap contains ball bearings. Delco had a rudimentary lubrication system for its ball bearings where an oil soaked wick is contained within a reservoir. 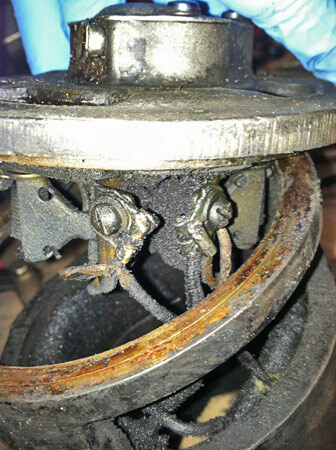 A small portion of the wick would touch the bearing thus providing lubrication as long as the car owner remembered to fill the reservoir! 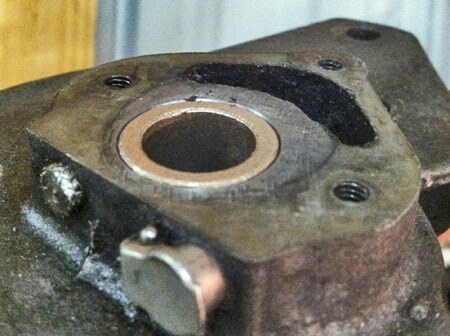 My new bearing is sealed and it and the bushing were easily pressed into position. 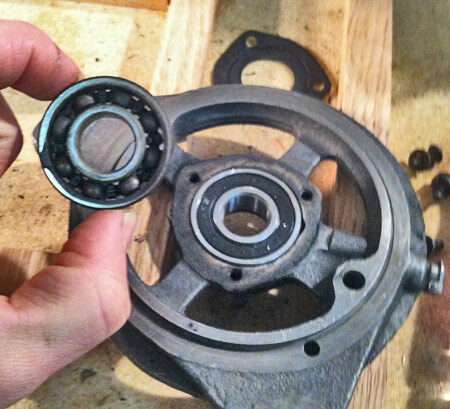 The generator's original ball bearing in my hand and my new, sealed bearing pressed into the end cap. 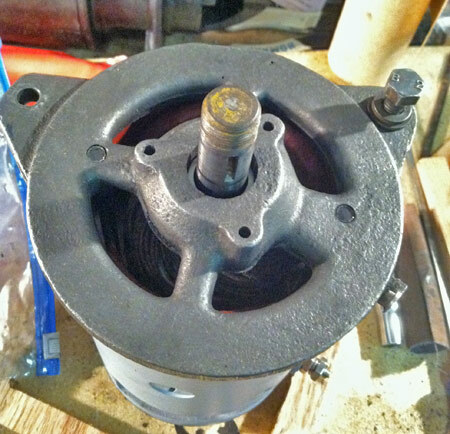 New bushing is pressed into place. 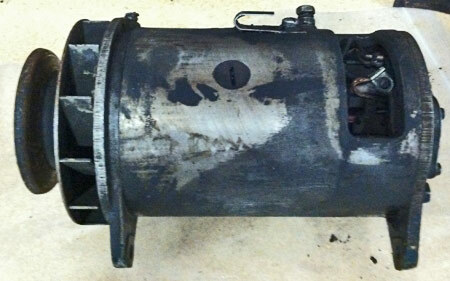 Once the generator case arrived back home new brushes were installed and the entire unit was reassembled. 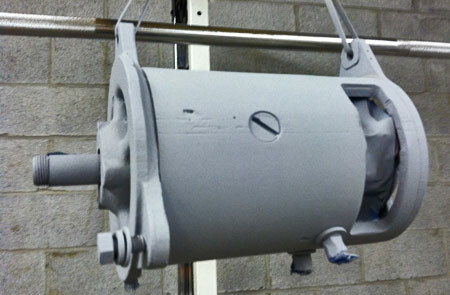 After priming the generator it was finished with black satin paint. The brand new Delco tag was tacked into place and my generator was ready for service. Assembled and getting ready for final prime. This looks much better than the mess I originally exposed! Unused exercise equipment makes a great painting rack! The finished product with brand new ID tag. Naturally I wondered if everything inside would spin freely so I grabbed the pulley shaft of the generator and gave it a twist. Remember my earlier lesson about the generation of electricity? Well, my generator generated plenty and my hand felt a nice blast! I shook my head and placed the generator in my office where it will remain until it is ready for installation on the completed engine. 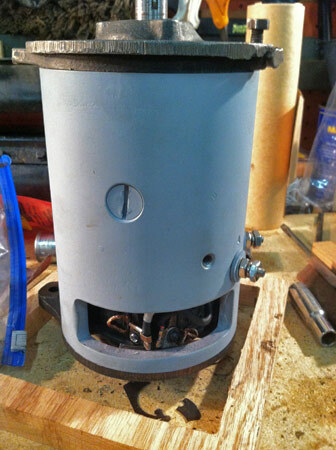 After finishing the assembly of my generator there was only one thing left to do — tear something apart! The lucky winner here would be my doors. In addition to needing exterior paint, the fabric panels need to be replaced as do a couple pieces of glass. The inside of the door should be sealed, insulated and all of the window regulator and door handle mechanisms and springs will also need a thorough cleaning. 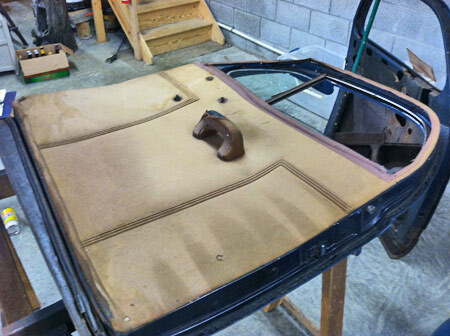 Passenger door ready for disassembly. Original fabric was the darker brown around the window and the window trim preserved it. The rest of the panel is bleached and faded. I need to replace this glass. All of the window trim had already been removed so I started by taking off the elbow rest and handles. Interior door handles come off by pressing down on the handle escutcheons to expose a small clip. The clip is pulled out with special pliers and the handles pop right off. 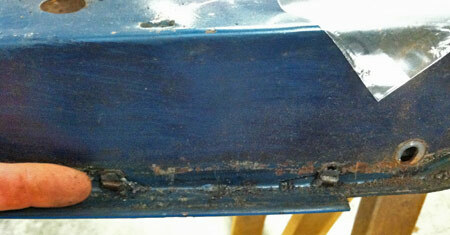 The fabric panel is also removed quite easily by prying the nails from the door. With the panel removed you then have direct access to the window and door mechanisms. Parts of the glass removal were a little tricky but I used the shop manual to guide my work. The first piece I had to remove was the vent. 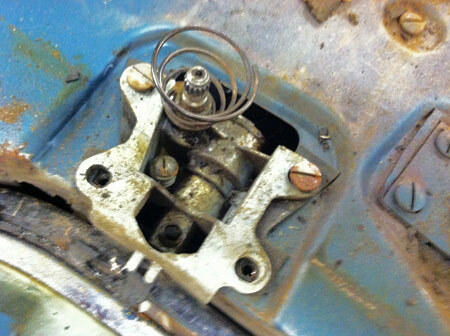 This is done by removing the screws that hold the regulator mechanism to the door panel. With those screws removed you then have to remove the divider that seals the main glass and the vent glass. With that out of the way the vent pane and mechanism simply lift right out. 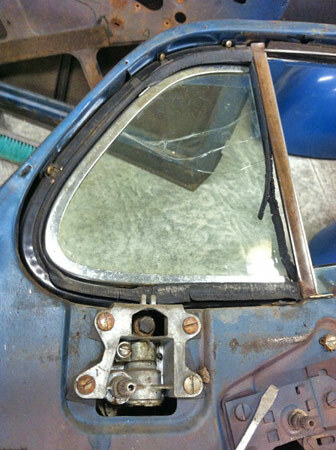 There are four screws holding the main glass to the shaft that raises and lowers the pane. With these screws and two more screws that hold a guide channel removed you crank the glass up and pull it up toward the inside of the door. The glass just clears and you can then take out the guide channels and complete winding mechanism. Vent pane & main window divider. With the glass out my attention was now focused on the door latch apparatus. The interior handle moves a shaft connected to the latching device. This latching device is also connected to the outside door handle. The interior handle contraption & shaft came out very easily. But the exterior handle required Shop Manual guidance. 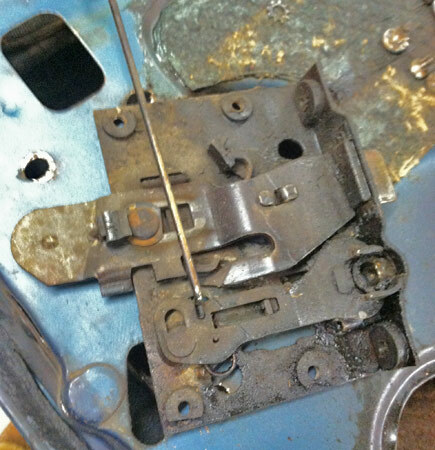 You can take off the exterior handle by removing a set screw found next to the door latch. After that is out you wiggle the handle and it will come off with a pop. 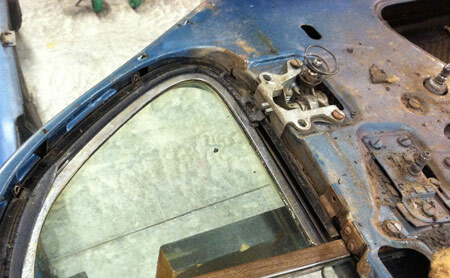 Four more screws hold the latch mechanism to the door and it is then twisted and persuaded out through the panel. Interior handle mechanism. Note shaft that will attach to exterior door latch. What remained on the door was the stainless steel trim on the outside of the door and a bunch of petrified weather stripping. The stainless trim strip is held on to the body with clips and they can be pressed out of the door from the inside. Regarding the weather stripping I originally thought I would have to use a torch to remove the aged material but was extremely happy when I discovered it chipped right off with screw drivers and a paint can opener! Weather-stripping on the bottom of the door & clips that affix it to the door. This little tap holds the lower weather-stripping tight against the door. 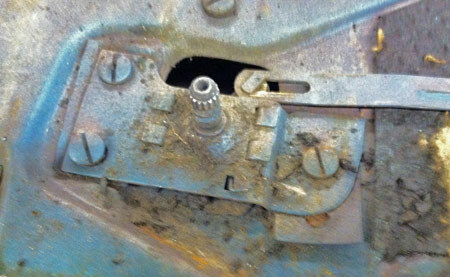 The little set screw that will release the exterior door handle is found in this hole. The door latch assembly liberated from the door. Weather stripping removed but clips remain. This 77-year-old rubber is now petrified. The next phase of my work will require me to assess the amount of rust on the inside panels and then determine the best way to remove it. 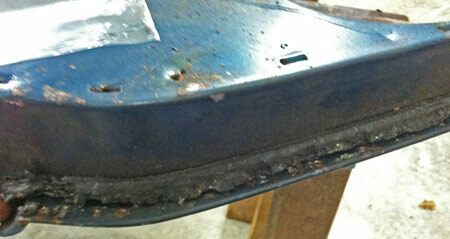 With luck there won't be anything I can't reach so sandpaper and a rust encapsulator may do the trick. I will also have to get new glass panels made and completely clean all of the oily and dirty window and latch mechanisms. Tackling a disassembly job like this really emphasizes the amount of behind the scenes work that goes into car restoration. I am regularly teased by friends and family that no progress is being made on my car. They only see shiny stuff as progress and simply don't realize what it takes to get something ready for final paint and buffing. To be honest, I don't know how many hours of door work lay ahead of me on this specific project but I will get there eventually. Taking apart my doors took about four hours total. Dismantling, cleaning, prepping and painting my generator took a few days work as well and that doesn't count the amount of time I waited for my case and coils to be returned. I couldn't afford to pay a restorer to work on my doors but even if I could I wouldn't. For me, working on this car is a labor of love. 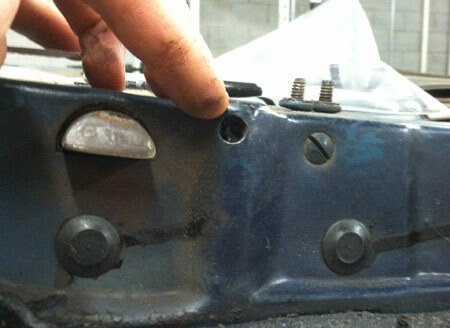 I know I am making progress and I know I am getting an amazing education on the inner workings of my car. Soon enough I will finish disassembling and start putting more things back together. Until then I will stick with what I do best!